The Economical Approach for Protecting FBE, Powder Coated, Urethane Coated or Costly Stainless Steel Pipe. When cost becomes a factor, ESI's steel backed polyurethane strips are the ideal solution for protecting previously coated pipe from damage. 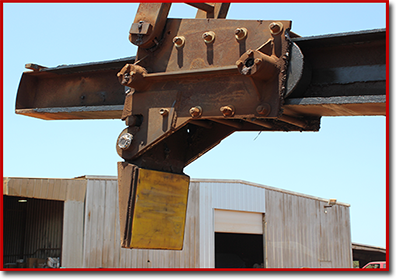 We use 10 and 11 guage steel cut into 8 feet and 10 feet lengths with our toughest polyurethane bonded to the steel surface. They are available in widths of 2 inches and up to 6 inches (wider upon request). 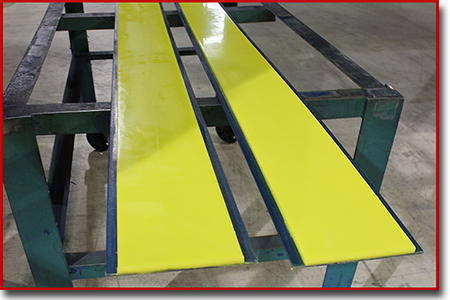 When we bond our urethane to the previously grit blasted and primed steel surface, we leave a 1/4 inch to 1/2 inch uncoated area of steel around the polyurethane. This allows for tack welding the strip to the steel fork tine without burning the polyurethane. 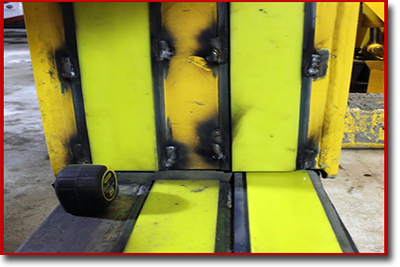 We cast the polyurethane onto the steel strips all the way to each end of the strip, but leave the 1/4 inch or 1/2 inch space on both sides of the strips for welding. ESI's unique cast polyurethane formulation has been specifically engineered for high impact and abrasion resistance. Our strips can be welded to either the lower or upper fork tine or both for maximum coating protection. 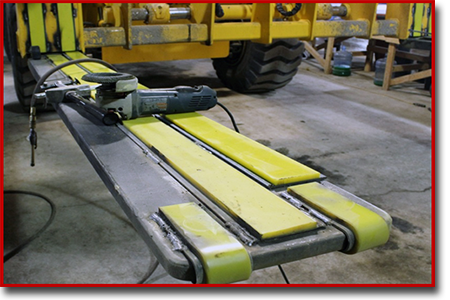 In addition, our coated steel strips can be tack welded to the back, upright vertical section of the fork lift to protect the pipe as it rolls back and rests against the tine. 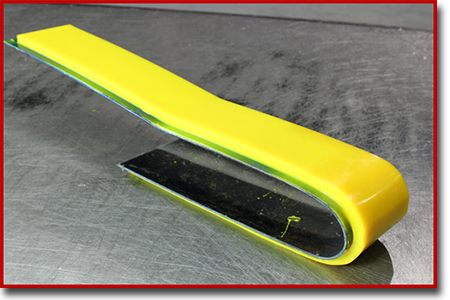 Designed to protect the upper tip (tooth) of the clamp arm of the fork lift, we pre-bend steel then bond our urethane to the surface. These pieces are also designed to be tack welded to the tip of the fork tine for additional protection against damage to the coated pipe. These coated tip covers are also available. 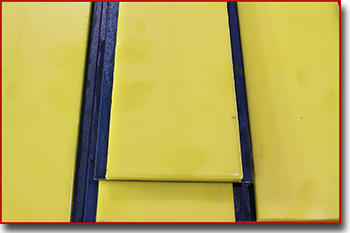 We also sell our polyurethane coated strips for use as rack padding in pipe yards to protect various types of coated pipe. 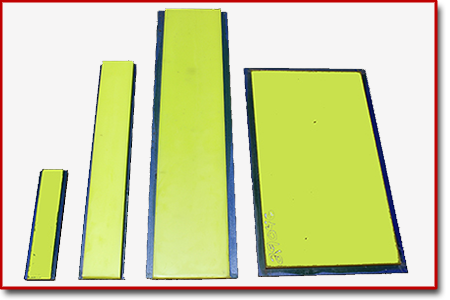 ESI will also produce the steel strips in almost any width, thickness and length up to 10 feet upon request. Contact ESI for pricing on all steel coated strips! 1/8" 2" 10' 1/4", 3/8", 1/2"
1/8" 3" 10' 1/4", 3/8", 1/2"
1/8" 4" 10' 1/4", 3/8", 1/2"
1/8" 5" 10' 1/4", 3/8", 1/2"
1/8" 6" 10' 1/4", 3/8", 1/2"